Location: Shipka is a real cultural centre of the Bulgarian lands. The town is situated just 5 km from the beautiful rose town of Kazanlak, in close vicinity to Koprinka Dam and the valley of the Thracian Kings. The beauty of the area, the good climate and fresh mountain air of Shipka ensures relaxing holidays throughout the whole year. 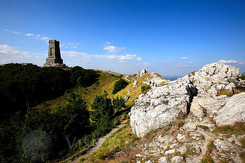 Sightseeing: One of the most popular attractions and a symbol of the town is the Russian Church of Shipka. 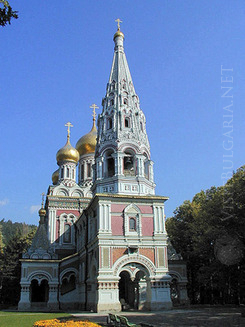 In honour of the perished Russian soldiers and Bulgarian volunteers in the Russian – Turkish war of liberation a large beautiful monastery “Nativity” was built at the foot of Stara Planina above the town of Shipka. The monastery church “Nativity” is very impressive. It is real masterpiece of architecture and was declared as a monument of culture. The temple was built in the Russian cathedrals traditional style from 17 century. The golden domes are shining far from the distance and the versicoloured inlays are like alive. There is 53 m long bell tower with 17 bells. The biggest one weights 12 t. The visitors can see 24 marble plates with the names of 18,491 Russian and Bulgarian soldiers who gave their life in battle at Shipka and Kazanlak. Vicinities: The famous “Golyamata Kosmatka” Mound, Shipka Peak, Shipka Monastery, the valley of the kings with numerouus mounds, tombs and sanctuaries of Thracian origin, as well as Koprinka Dam are situated in the surrounding areas of the beautiful town of Shipka. Rich in history, mysterious and charming, Shipka awaits you!